If you have already found your Birthday Accessories and Birthday Decorations then it is time for tableware! Check out all of the different tableware designs that we offer. Whether you are hosting a vibrantly colored birthday party or a dark and humorous over the hill party, we have plenty of tableware to suit your needs. Looking for the perfect birthday tableware to match your birthday decorations? We have just what you need. Browse through our wide variety of printed birthday tableware. Create your own tableware look by pairing any of the printed birthday tableware with our Solid Color Tableware. Mix and match to create the look perfect for your birthday celebration! Choosing the right tableware for a girls party can be somewhat of a challenge. If you are having a young girls birthday party I would say between the ages of 3 and 10 we have a great collection of cupcake birthday tableware. This tableware is cute, will match almost any theme she wants to have, and has a variety of fun exciting colors. If you are planning a preteen or teenagers birthday you should use our variety of animal print tableware. If you would like to use happy birthday themed tableware for you preteen or teenagers birthday party our lively birthday,or our birthday pops tableware are sure to please your birthday girl. Are you picking tableware for a boys party but you don't know what type of tableware he would be interested in? For a young boys birthday party one of our top selling tableware that every young boy will go crazy over are our angry birds themed tableware. When you are planning a young boys birthday party finding tableware to match a theme is easier than finding tableware for a preteen or teenage boy. Boys generally don't mind what their tableware looks like as long as it doesn't look too girly. If you are looking for tableware that your son wouldn't get embarassed by check out our solid designer disposable tableware. One of our top sellers is our classic navy blue, that is perfect for any young mans birthday celebration. Finding tableware for an adult is super easy. The majority of the time you just need to get solid color tableware, and that will be perfect for their party needs. What happens if the birthday boy or girl doesn't want solid color tableware. Well here are a few suggestions that many adults love to use for their birthday party tableware needs. 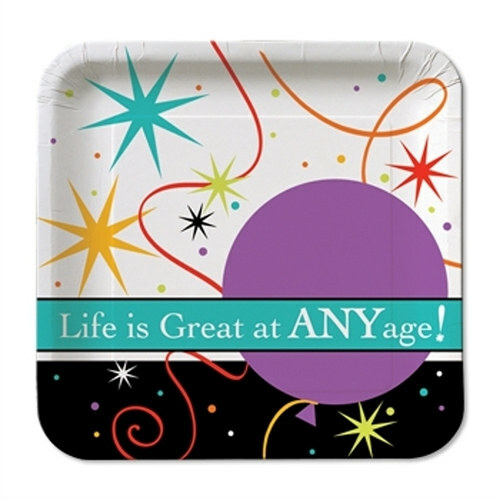 Our birthday celebration tableware is great for anyone who is turning 30, 40, 50 or older! We also have our fun over the hill collection of tableware that are great for those who over the hill and proud!